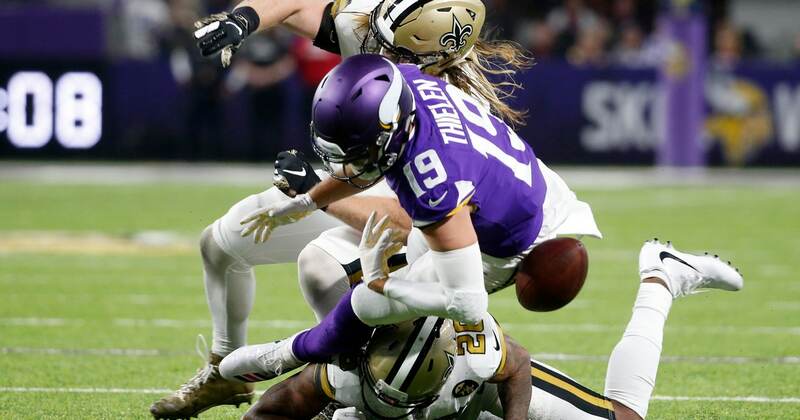 MINNEAPOLIS (AP) — Adam Thielen was putting together yet another stellar performance for the Minnesota Vikings, who were on the verge of extending a three-point lead late in the second quarter when Thielen plunged forward for extra yardage after a short first-down catch. In the third quarter, the other half of Minnesota’s dominant wide receiver duo made a costly mistake, too. Stefon Diggs, who had his own standout game with 10 catches for 119 yards and a score, stopped a drag route too soon while an under-pressure Kirk Cousins tried to dump the ball off but had it intercepted by P.J. Williams for a 45-yard touchdown return . The last time the Vikings faced the Saints, Diggs famously turned a sideline catch into a 61-yard touchdown on the last play of their NFC divisional round playoff game to beat the Saints 29-24. The “Minneapolis Miracle,” it was called.